Last week in Portland, quirk pop maestro Jonathan Coulton explained to the sold-out crowd that, as a grade school student, he had anonymously left a note for a co-ed classmate with the binary question: do you like me? Yes/No. Though it was passed secretly, the young girl knew who left the proposal because Coulton sat right next to her. Tragically, he witnessed his would-be inamorata hit the roller skating rink with another dude shortly after a passive decline. Headliner Aimee Mann is also a modern storytelling master, who can weave tales of desperation, longing and occasional redemption into immaculately constructed three-and-a-half minute confessionals. The difference between her and Coulton is that the former sings about self-loathing giant squids while the latter addresses alcoholic boxers and California dreamers on the verge of harsh awakenings. Together, they comprise a new incarnation of Greek Muses Thalia and Melpomene, intoxicating with humor before summoning a tidal wave of melancholia. And Mann’s recent, exceptional album—Mental Illness —will absolutely invite tear jerks. Paste photographer Sean Edgar captured the concert in the gallery above, which saw both Mann join Coulton’s opening set and Coulton reciprocate (Coulton contributed background vocals and acoustic guitar to Mental Illness). 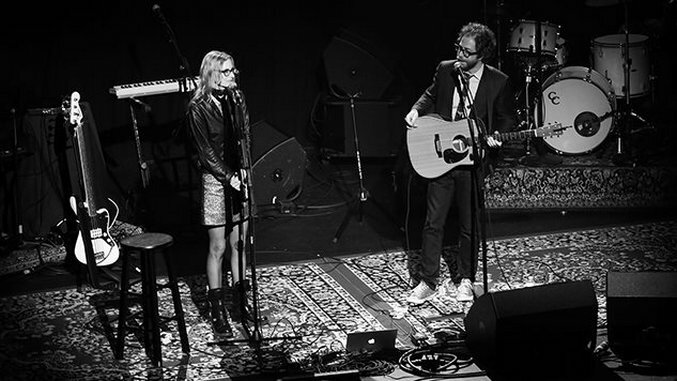 Aimee Mann is touring extensively in the US through July before hitting Europe in October; Coulton will continue to join her for all of those shows, as well as play a smattering of other gigs and events.